If you know me, you know I love a good theme. 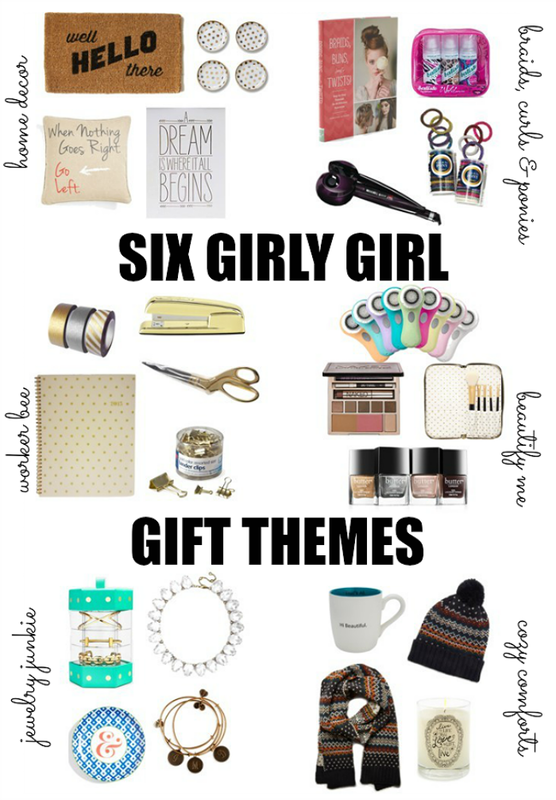 So, today put together six for holiday gift ideas. This is for girls only. No boys allowed. I have rounded up a few other holiday gifts over the last few weeks. If you need more ideas, be sure to check out my own wish list, one all about plaid, other unique pieces and one for the guys. I wanted this one to entail some fresh presents that haven't been mentioned in this year's holiday posts. Most everything you see below ranges from stocking stuffer prices to something that might be a bigger ticket item for your loved one. There is truly something here (or at least an idea) for all the ladies in your life. There are a few items I want to call out before you start shopping. I am obsessed with dry shampoo. Although, I haven't personally tried the Batiste brand, it has great reviews. This would be perfect as a stocking stuffer or a girlfriend gift. They are travel size and great for throwing in a purse, a gym bag or stashing in a glove box for on-the-go moments. Urban Decay Naked On The Run....holy smokes!! I ended up buying this for myself. I just couldn't wait until Christmas. I am mostly OBSESSED with the shadow colors and mascara, but love it all. Put it on your list or buy it for someone that will share. Alex and Ani bangles...enough said. They are the epitome of a perfect girl gift. There are hundreds options and so fun to stack. I have mentioned Alex and Ani several times on my blog and own several. The initial charms are my favorite for a more personalized gift, but you really need to browse around. I actually purchased four as gifts this year. I can't say who they are for! The last item I wanted to shout from the rooftops is the Bauble Bar Everyday Stack available at Nordstrom. I am shouting because I want it for myself. Ha! Three stackable bracelets for less than $60? This is the present of the season and a gift givers dream. Ladies? What do ya think? I am right? I love the worker bee set. Great picks! I love alll the different themes!! Love these picks- so cute! I'm going to a white elephant and was lacking inspiration! p.s. did you know you turned word verification on? So many great ideas here, thanks for sharing!! I'm in love with that gold bangle set and the packaging is adorable! Great ideas! We are giving three Alex and Ani bracelets as gifts this year... they are the perfect gift and a great price point! So fun! Love the themes :) Great picks, too! All so very cute! Especially the home decor ones! Awesome ideas!! Love the categories! I love Alex & Ani Bracelets..great list of gift ideas!